Pre-Dental Exam – Physical examination of the eyes, nose, ears, mouth, abdomen, legs, lymph nodes, skin, and coat, as well as listening to the heart, lungs, recording temperature and weight. Pre-Operative Antibiotic Injection – To prevent infection due to the bacteria that is released from the plaque during the scaling of the teeth. Place IV-Catheter – Allows for rapid and direct distribution of medications and fluids during the dental procedure. Pre-Operative Blood Evaluation – Evaluate the liver, kidneys, electrolytes, and blood counts to ensure anesthesia is catered to your pet’s medical conditions. Sedation & Pain Injection – Decreases pre-operative anxiety and pain during the procedure, and relaxes them in preparation for anesthesia induction. Anesthesia Induction – Injections are given to sedate, and an endotracheal tube is placed to administer inhalant anesthesia and maintain respiration during the procedure. Pulse Oximetry & Anesthesia Monitoring – Assists in monitoring the heart rate and oxygen saturation while under anesthesia. A technician trained in anesthesia will also be with your pet at all times to monitor the temperature, heart rate, respiratory rate, blood pressure, and EKG. IV-Fluid Therapy – Helps maintain hydration and blood pressure during dental cleaning. Temperature Management System – The use of heating pads, warming tables, blankets, and warm water bottles to keep your pet warm and comfortable while under anesthesia, as anesthesia can cause a drop in body temperature. Ultrasonic Scaling – High powered instrument supplying high frequency vibrations, used to remove plaque, bacteria, and calculus from the teeth. Sub-gingival Cutterage – The removal of calculus and plaque found on the tooth below the gum line. Probing for Pockets & Gingival Recession – Measure pocket depths around a tooth and check for exposure of root surface to establish periodontitis and periodontal pockets, and determine if x-rays and extractions may be necessary. Irrigate – Flushing of the mouth to remove loosened plaque and bacteria from dental surfaces. Dental X-ray – After probing, an x-ray may be taken to determine whether extractions are necessary due to bone loss and tooth decay, and to identify open root canals & infected tooth roots. Polish – To smooth the surface after the scaling of the teeth to decrease the adhesive ability of plaque in the future. Fluoride – An anti-plaque treatment used to help strengthen and desensitize teeth and discourage the development of future plaque. Recovery – A technician will monitor your pet after anesthesia until they are awake with the ability to stand up and has recovered swallowing reflexes. Remove Catheter – The IV catheter remains in place until your pet is ready to be discharged. A pressure bandage is placed to prevent bleeding, and is usually ready to be removed 15-20 minutes after. Dental Charting – The doctor and technician will complete a detailed medical chart after the procedure, along with home care instructions. The technician will call you to arrange a pick-up time after your pet is awake from anesthesia. 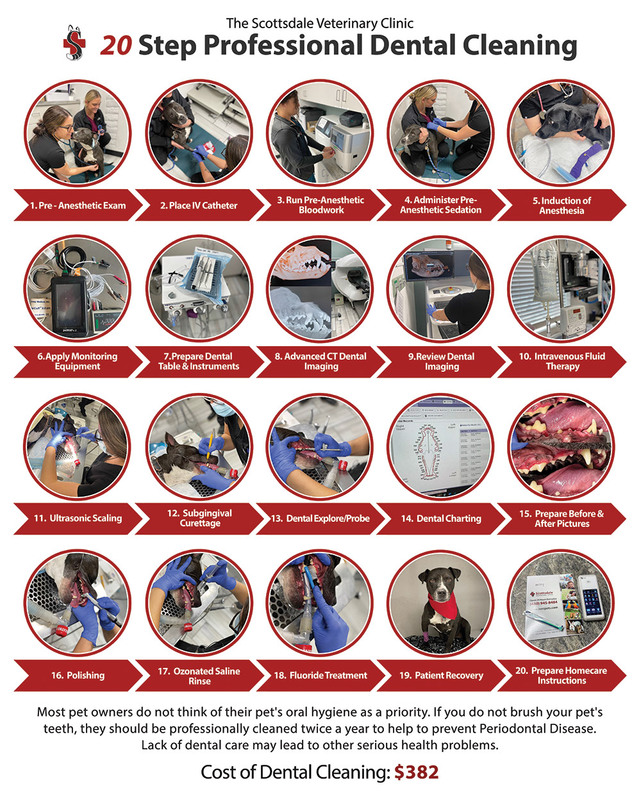 Home Care & Dental Aftercare – The technician will go over any home care instructions and questions you may have, and we also send home a list of recommended preventative care techniques to help keep your pet’s teeth clean and plaque free.